an healthy and balanced food choice. The product of Argon food are designed to meet the nutritional needs of small, medium and large dog at all stages of his life. Our recipes are formulated using quality ingredients and dosing high nutrient content, which promote excellent digestibility. The presence of fresh meat brings to the daily diet high biological value proteins that make Argon food highly palatable and digestible. The recipes of the Argon food, are free of dyes and added preservatives, to bring to the dog what he needs for his health and his natural well-being. 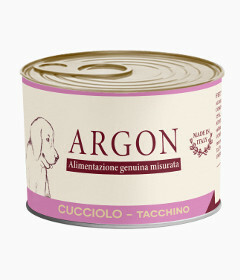 Argon CUCCIOLO is a recipe designed to meet the nutritional needs of puppies in growth .The turkey meat makes to the daily diet of your puppy high biological value proteins, highly digestible, which help to get a proper development of the musculoskeletal structure. Vitamin D regulates blood’s levels of calcium and phosphorus and it is important for the formation of bone tissue and for the proper functioning of muscles and the nervous system. 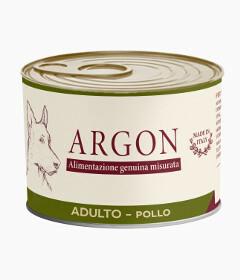 Argon ADULTO is a recipe designed to meet the nutritional needs of the adult dog. The high percentage of chicken meat brings to the daily diet of your dog high biological value proteins that guarantee high digestibility of the food. The intake of essential fatty acids and vitamins promote the maintenance of a thick and soft coat and help your dog to keep younger over time, counteracting the effects of aging. 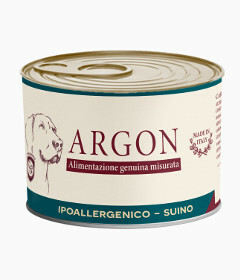 Argon IPOALLERGENICO is a recipe designed to meet the nutritional needs of the adult dog. The exclusive presence of pork brings to the daily diet of your dog high biological value proteins that make this food highly digestible, light and suitable to dogs to with food hypersensitivity. The intake of vitamin E promotes the rebalancing of the natural immune system and counteracts cell aging.